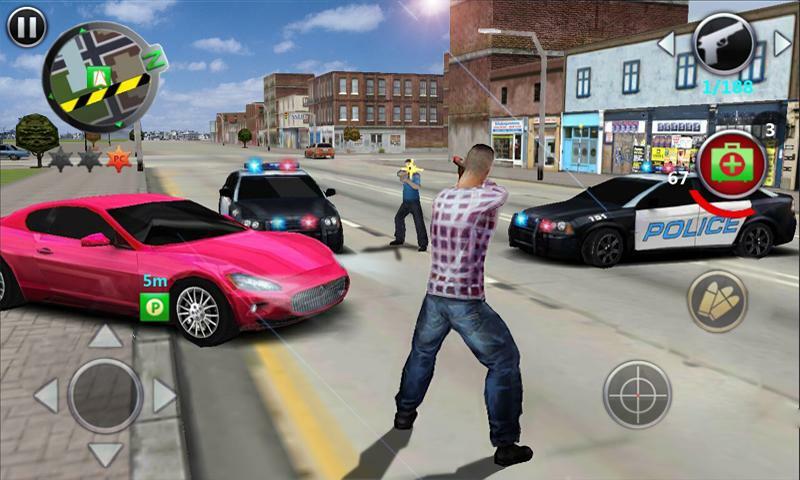 Grand Gangsters 3D from Doodle Mobile puts in the middle of Sin City where your goal is to work your way up the criminal syndicates’ ladder; stealing cars and performing other missions while avoiding the cops. It’s part auto racing, shooter and beat ‘em up. If you’ve played Grand Theft Auto, you have a pretty good idea of what Grand Gangsters 3D is about. Controls are simple: just turn your fingers on the arrows to go in any direction and swipe to change the angle right or left. If you want to aim at something, just tap that and then tap the target button to shoot or punch. To steal a car, just go near and tap the icon representing the car door. When you’re in the car, the controls change to brake and pedals, and the arrows let you make turns. Physics doesn’t play a major role in this game, but it’s still best to avoid hitting large structures and just try to mow down the people around you instead for fun. As for the missions they vary: some will require you to run over and kill as many people as possible, while others require you to shoot X number of targets. Other missions are of the route / delivery type where you have to get in a vehicle and try to reach your destination in a specific amount of time. Then there are the survival missions where you need to battle through waves of gangsters going after you in all directions. Bottom line: if you love action games, you’re going to enjoy Grand Gangsters 3D.